The U.S. entertainment industry reached a milestone in April 2017. The Entertainment Services and Technology Association (ESTA) released its first ANSI-accredited industry standard for inspecting theatrical rigging, both manual and automated. Naturally, this new, recommended standard has raised questions within the performing arts. Why is the standard needed? How will it affect schools and professional venues? Who can help with compliance? 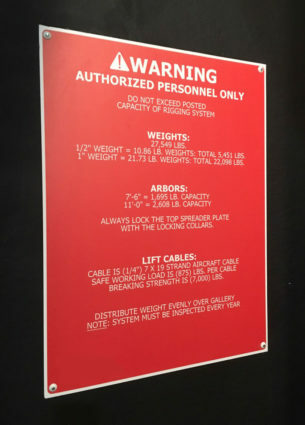 Here’s an overview of what to know, including how J.R. Clancy and Wenger can help you create a safer environment and extend the life of your theatrical equipment. The use of rigging and hoists in theatre applications is ever increasing. Yet, historically, the people responsible for keeping that equipment and those who use it safe had no formal guidelines, said Karl Ruling. As the ESTA technical standards manager, Ruling oversees the program and worked with the industry professionals who developed the new ANSI E1.47 – 2017 Recommended Guidelines for Entertainment Rigging System Inspections. It is the industry’s first written record of current best practices. (Click here to download a free copy of this standard for your facility’s management and ownership (look for ANSI E1.47 – 2017). “Previously, owners or third-parties were using whatever they had at hand or could make up on their own. This standard sets formal guidelines, which are the consensus of the industry, for routine inspections conducted by the system owner and third-party inspectors,” Ruling said. According to the standard, rigging inspections are recommended as a component of theatrical workplace safety programs. The standard offers guidance on inspecting entertainment rigging systems used to lift and support scenery, luminaires, and other equipment overhead in entertainment venues, including theatres, video/film studios, amphitheaters and arenas used for live performances or special events. “It took the Rigging Working Group nearly five years to create the industry standard. Every word is there for a reason,” Ruling added. How are schools and professional venues affected? The new standard will affect a wide range of venues and personnel across the performing arts: rigging system owners, rigging system inspectors, stagehands, performers, insurance companies and occupational health and safety authorities. Ruling believes the affect will only be positive. “Standards prevent accidents, protect lives and property, save time and money, solve problems, inform the industry, and enhance creativity.” Yet, he said, some inspections were not being done – either never or on a very infrequent basis. The standard recommends the frequency of inspections. In particular, it states that manually operated equipment and motorized equipment should be inspected annually or immediately after equipment or components have been newly installed, altered or repaired. Ruling added that the standard’s ethics section addresses one particular issue that had created some inspection resistance from system owners and schools in the past. Who can help with compliance? As Ruling stated, seek help from a professional. J.R. Clancy has more than 130 years of experience and a respected proprietary safety program – TIM (Train, Inspect, Maintain). All our rigging inspectors are certified through ESTA’s Entertainment Technician Certification Program (ETCP). Launch your new year by following the new ESTA standard. Get an inspection. To request information or to schedule a J.R. Clancy inspection, use this online form or contact us at service@jrclancy.com. We wish you a happy – and, above all, safe – new year!